Mike Downes most recent recording Root Structure, features his present quartet with Robi Botos (JUNO Award winner 2016), Ted Quinlan (JUNO nomination 2003) and Larnell Lewis (Grammy award winner with Snarky Puppy 2017). It won Jazz Album of the Year: Solo at the 2018 JUNO Awards. Mike has been a prominent Canadian bassist, composer, arranger and educator since the early 1980s. His musicality, emotional depth and melodic approach to the bass have thrilled audiences in Europe, Japan, South Korea, Brazil, Mexico, Israel, Iceland, the United States and Canada. In addition to leading his own groups, Mike has performed with virtually all of Canada’s top jazz musicians, including Molly Johnson, Oliver Jones, PJ Perry, Lorne Lofsky, Don Thompson, Kirk MacDonald, Robi Botos and Pat LaBarbera. He has performed with international artists Pat Metheny, Chris Potter, Michael Brecker, John Abercrombie, Peter Erskine, Kenny Wheeler, John Taylor, Dave Liebman and many others. 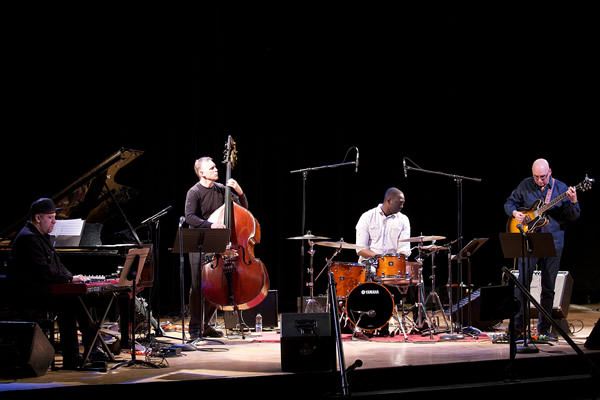 Mike won a 2014 Juno Award for Traditional Jazz Album of the Year with his Trio recording, Ripple Effect, featuring pianist Robi Botos and drummer Ethan Ardelli. Mike’s most recent recording Root Structure, features his present quartet with Robi Botos (JUNO Award winner 2016), Ted Quinlan (JUNO nomination 2003) and Larnell Lewis (Grammy award winner with Snarky Puppy 2017) won Jazz Album of the Year: Solo at the 2018 JUNO Awards. Mike’s extensive discography also highlights his work as a performer, arranger, composer and producer for other artists. Aside from his multiple JUNO Award- Winning recordings as a leader, other JUNO wins and nominated recordings include Molly Johnson’s Lucky, Another Day and Messin’ Around, Shirantha Beddage’s Identity and Momentum, Lorne Lofsky’s Bill Please, Jens Lindemann and Tommy Banks’ Legacy Live, and Ranee Lee’s Dark Divas and Maple Groove. Helping to mentor and inspire young musicians is an important component of Mike’s career. He has been the Bass Department Head at prestigious Humber College in Toronto since 2000. He has been featured as a Yamaha artist/clinician throughout Canada, at the Paekche Institute in Seoul, South Korea and the famous Conservatoire de Paris. Mike is the author of The Jazz Bass Line Book published by Advance Music of Germany. The book is receiving world-wide acclaim as one of the most informative books available on the subject. He is also co-author of Jazz and Contemporary Music Theory. This will be a KSMF Evening Concert you won’t want to miss!